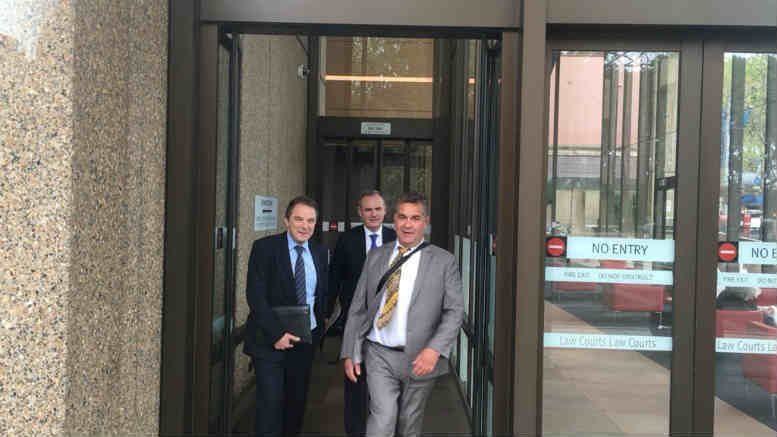 Not the Achilles to beware of - Achilles 'Al Junior' Constantinidis (R) at the NSW Supreme Court this week. Not the Achilles to beware of – Achilles ‘Al Junior’ Constantinidis. Trading on a business under a license agreement would seem to be a perfectly normal proposition for insolvency practitioners extracting the last vestiges of value from a failing company but the agreement entered into by Veritas Advisory’s David Iannuzzi and Steve Naidenov as administrators of the MK Floors Group could not be described as normal. For a start, the licensee was a company called Chiswick which is owned by a suburban Sydney accountant who told a court this week that the only flooring experience he’d had was laying carpet during his university years. The accountant’s name is Achilles Constantinidis, of Cabarita. The 49 year old admitted under questioning by barrister Ross Foreman that he had signed the license agreement in his capacity as sole director and shareholder of Chiswick without reading it. He signed the document, which he said had comprised just two pages, because he was asked to do so by his first cousin, Achilles Constantinidis. Wait? There’s two Achilles Constantinidis? No, not even close. “There are about six of us,” the witness, who is referred to as “Al Junior” told the court at one point after Foreman queried which Achilles was which. Given the irregularities around the license agreement and the fact that payments were made into the Constantinidis Accounting Trust Account by MK debtors prior to Iannuzzi and Naidenov’s appointment, the FEG Recovery Unit is pressing the Veritas pair for repayment of around $750,000 paid out to MK employees after the company was placed into liquidation. While the practitioners have been questioned closely about their capacity to meet any judgment, their responses are subject to a non-publication order applying to both the court transcript and to any report of the proceedings produced by a journalist. Meanwhile only two of the six Constantinidis first cousins appear to have been involved in MK Floors. Al Junior and 63 year old “Al Senior” a struck-off chartered accountant with a penchant for getting involved in distressed assets that first gained public notoriety through a failed piggery venture in the 1990s with ex-Prime Minister Paul Keating. It was Al Senior who referred the MK Floors insolvency appointment to Iannuzzi. And it was Al Senior who, while working in Al Junior’s offices, appears to have gotten involved in MK Floors. A clue to how that might’ve happened lays in Al Junior’ client list, which includes a former MK Floors employee who Al Junior said had been his client of Constantinidis Accounting for 15 years. As Foreman continued his questioning it became apparent that Al Senior had a great deal of latitude in the affairs of Al Junior’s accounting practice. Funds from Al Senior’s clients for example were paid into the Constantinidis Accounting Trust Account same as funds from Al Junior’s client. That trust accountant was never audited either. Al Junior’s computer was also potentially free to be used by anyone in the office, as was the practice letterhead. Given these circumstances it will come as no surprise to readers to learn that the license agreement comprises a lot more than two pages. The examinations continue. Be the first to comment on "Beware of Achilles bearing license agreements"